The price is for a complete set of towing mirror, left and rightside. These are the manual mirror, made of ABS plastic. This item is complete mirror assembly, not only cover. 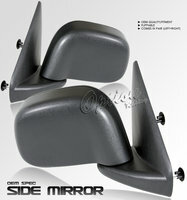 Upgrade your old broken mirrors with chrome mirror.